A good write up from the Times newspaper. Another good reason to get an Appledore turkey from us! | Website for Bashford & Co.
Now is the time of year when you want to do things properly. And — even if it does cost a few pounds more — many of us will want the best Christmas turkey we can afford. 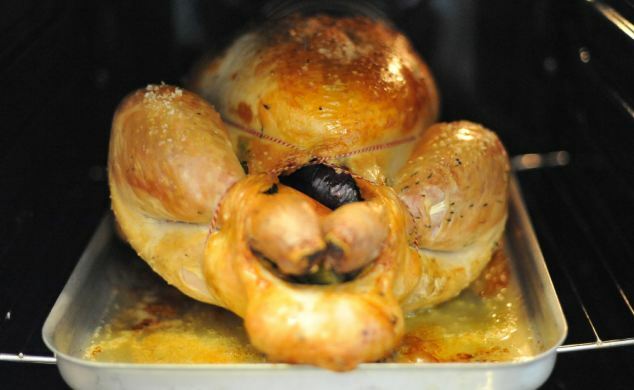 Despite the recession, hundreds of thousands of families will be tucking into a free-range turkey this Christmas. Free-range meat is now mainstream. 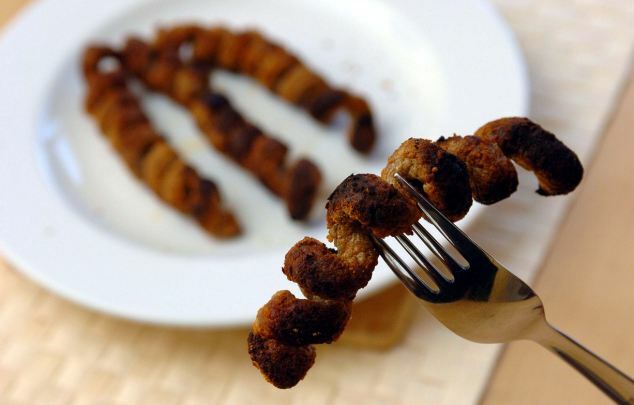 Even Bernard Matthews — creator of the notorious Turkey Twizzler — will produce 364,000 free-range turkeys this year. 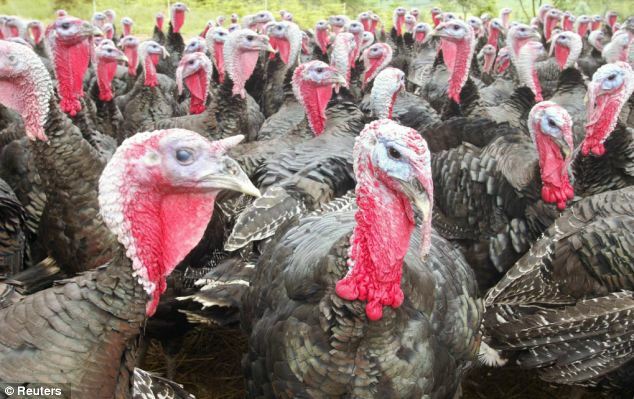 Turkey: Will the truth about free-range turkeys put you off your Christmas dinner? But what has brought on this enthusiasm for free-range birds at a time when many are tightening their belts? Because we’ve seen the pictures and read the horror stories about intensively reared poultry. We know that the life of a battery turkey, as of a battery chicken, is grim. Tens of thousands of birds sharing one darkened shed (daylight makes the birds more active and therefore troublesome); virtually no room to move; their beaks cut off with a red-hot blade in order to prevent them from pecking each other to death. Which is why so many of us look for two magic words on the wrapper when we go shopping for our Christmas turkey: free range. We feel reassured that the bird in question has been allowed to grow up out of doors, to feel the wind in its feathers, and the sunshine on its back. But, alarmingly, this bucolic fantasy is far from the truth. At the top end of the market, free-range turkeys enjoy a good life — air, wind, sun — but if you’re a farmer who chooses to observe the free-range minimum standards, the life of your turkey is, frankly, not a huge amount better than that of an intensively reared bird. And the wrapper will give you no clues. Still those same two words: Free range. 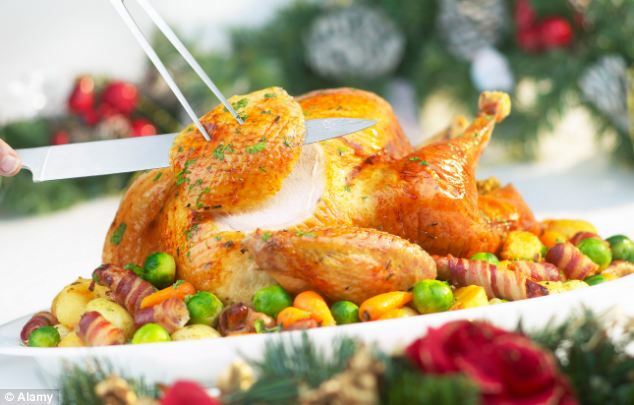 Pricey: Despite the recession, hundreds of thousands of families will be tucking into a free-range turkey this Christmas, but what has brought on this enthusiasm? The rules, as they currently stand, are by no means in the birds’ best interest. When it comes to battery farming, there is no government legislation regarding intensive turkey production, but if a farmer wants to sell to supermarkets, he needs to be in the Red Tractor approval scheme. A Red Tractor intensive farm is allowed a ‘maximum stocking density’ — the number of birds in a set area — of 51kg of turkey per square metre. In practice, this means that a typical bird has, on average, a living space two-thirds the size of an opened broadsheet newspaper. And what about free-range turkeys? How much space are they guaranteed by law. On a free-range turkey farm, the maximum stocking density is 25kg per square metre — twice as much as an intensively farmed turkey. Which sounds reasonably impressive for a moment. Until you imagine one-and-a-third opened broadsheet newspapers — and learn that a large breed of turkey can grow to the size of a small labrador. As for flock size, there’s no limit to how many battery turkeys share a shed — some farms are home to 50,000 birds. There is also no limit imposed on flock size for free-range turkeys. 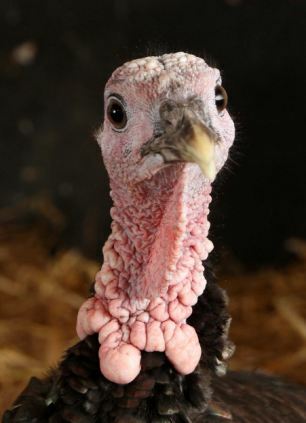 The pleasing idea of a dozen turkeys gobbling their way around a field or farmyard bears little relation to the reality. Nor is beak-trimming confined to battery-raised birds. It’s routinely carried out on free-range farms, too — though not as frequently. The animal welfare charity Compassion in World Farming says the practice is horribly cruel. The practice is only off-limits to farmers who sign up to an organic regime. But the biggest myth of free-range turkey farming is that the animals spend much of their time outdoors. The phrase free-range suggests freedom, exercise and open spaces. Isn’t that the difference between free-range birds and their battery cousins? The shocking truth is that the free-range turkey on your plate might never have ventured outdoors. The rules says a free-range bird must have ‘continuous daytime access to open-air runs’. But there’s a world of difference between being offered ‘access’ and actually taking it. In practice, on large-scale free-range farms, only a few of the birds avail themselves of this freedom. Meanwhile, the others — thousands — stay indoors all the time, either too frightened to go out or too unadventurous. Jody Scheckter — an organic turkey farmer who also raises buffalo, cattle and sheep on his Laverstoke Park Farm outside Basingstoke, Hants — says consumers have been hoodwinked by the free-range industry. Scheckter says that if you want the best-tasting, healthiest food, ‘the birds need to be outside, eating the grasses and the bugs. Chris Atkinson, head of standards at the Soil Association, responsible for policing organic farmers, says the more nervous birds in a flock may be afraid to leave the shed because alpha males often block the exits, known as popholes, in order to demonstrate their dominance. Like shaven-headed bouncers guarding a city centre pub, they decide who is allowed through and who isn’t. 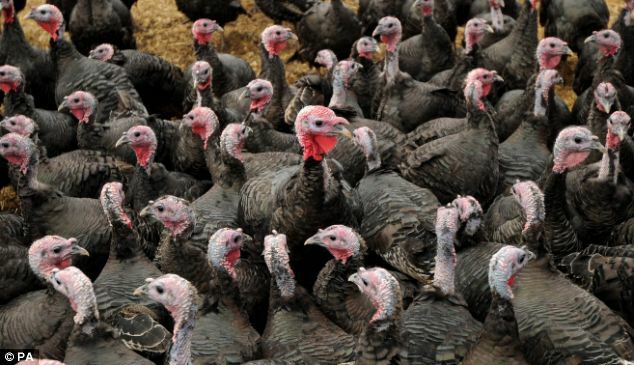 Fresh meat: Do free-range turkeys really have a better life? But what does an exemplary free-range farm look like? Pat Taylor owns Rutland Organic Poultry near Stamford, Lincolnshire, with her husband Henry. When I visit, there’s not a single bird who has opted to stay indoors. Instead, 140 turkeys, all of them from slow-reared, heritage breeds, are wandering around by the banks of the River Chater. One or two have settled happily in a 300-year-old willow tree. Having never encountered a flock of turkeys before, I’m taken aback by the noise they make. It’s loud, it’s undignified, it’s rather funny. Every time they hear a human voice, they respond in unison with a honking noise. It’s a bit like listening to the House of Commons benches during Prime Minister’s Questions. Pat has to shout to be heard above them. He worries about the idea of free-range ‘minimum requirements’. It’s not like that here. Pat won’t even have artificial insemination on her farm: all her turkeys have been naturally bred. Tellingly, battery birds are physically unable to mate because generations of selective breeding have led to birds with huge amounts of breast meat and small, short legs, which is what supermarket customers prefer. But Pat’s truly free-range birds come at a premium. She charges £50 for her smallest turkeys and £100 for the largest. Jody Scheckter’s are even more costly — at £20 per kilo, his turkeys are three times the price of a free-range bird from Tesco. And a Bernard Matthews bird? A spokeswoman for the company acknowledges that it observes the letter of the law — an indoor stocking density of 25kg per square metre — but no more than that. However, she took exception to the description of these conditions as ‘minimum standard’. Which is perfectly true: but it doesn’t take away from the fact that some free-range birds are freer to roam than others. Ultimately, the animal campaigners at Compassion in World Farming would rather you bought a free-range turkey than a battery one, even while acknowledging that at the bottom of the market the improvement in animal welfare is pretty marginal. As you stand by the cold counter in the supermarket choosing your bird next week, you may rightly wonder about what sort of life the free-range turkey in question might have had. Wind in their feathers and grass beneath their feet, or a patch of ground not much bigger than this newspaper?